The transition from April into May marks the end of spring and the beginning of summer. During this time, the northern hemisphere is flourishing with new growth and warmer weather. The memory of winter is melting away, being replaced with brighter prospects. During this time, the earth is fertile and ready to foster the animals and crops which in turn sustain us all. 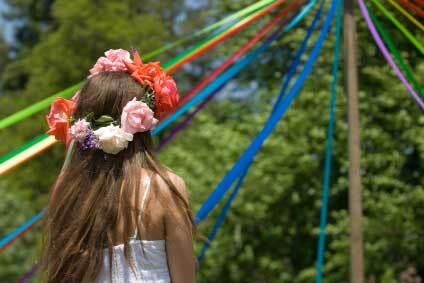 Beltane, or May Day, is a celebration of this new season, traditionally held on May 1st. 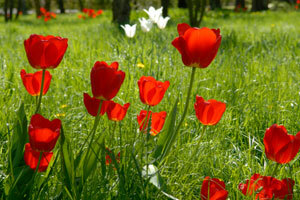 This originated in pre-Christian times with the festival of Flora, a Roman goddess of flowers. Beltane originated as an ancient Gaelic festival, which was observed in Ireland, Scotland, and the Isle of Man. These celebrations, and various other festivals held all over Europe, are closely related as they all celebrate the same thing. As a cross-quarter day, Beltane marks the midpoint in the suns journey between spring equinox and summer solstice. According to myth, during this time the goddess and the god are united in holy matrimony and their relationship consummated. This symbolizes the fertilization of the earth and animals for the coming year. As part of the celebration, many earth-centered religions perform a ritual known as the Great Rite. The Great Rite is a symbolic union of the male and female forces in creation. The holiday can be celebrated in other ways as well. Children, or those wanting to participate in ways other than the Great Rite, can make paper baskets by folding a piece of red or white decorative paper in half from one corner to the other; and string yarn through holes punched in the two connecting corners. Then, by placing a motley of spring flowers inside and leaving it on doorknobs, celebrants can spread the good will to friends and neighbors. This can be especially fun for children because you have to be sneaky and not let anyone know who brought them May flowers. Another May Day celebration is the dancing of the May Pole. In this rite, many colored ribbons are woven around the pole, symbolizing the union of the goddess and the god. This is accompanied by the jumping over bonfires and making wishes. While this celebration originated in Pagan and earth-centered religious, we all share the same home, and anyone can celebrate the changing of the seasons and the bounty that is provided by the Earth.